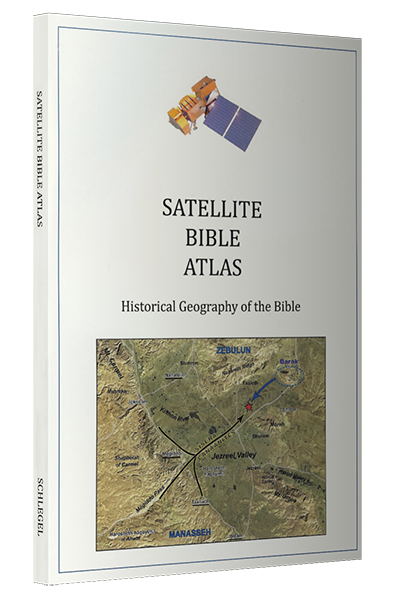 Todd Bolen announced Monday the publication of the Satellite Bible Atlas. This new work is by Bill Schlegel, Associate Professor of the Bible at IBEX in Israel. Bill has lived and taught in Israel since 1984. He taught at the Jerusalem University College (formerly the Institute of Holy Land Studies) before joining The Master’s College IBEX program in 1995. This resource is ready for personal use, classroom use, and field trip use. The author, Bill Schlegel, has been teaching college and seminary students in Israel for 25 years. Everything in the Satellite Bible Atlas is field-tested by a professor who knows God’s land and loves God’s Word. He continues to give 7 additional reasons why he loves the Satellite Bible Atlas. I will leave it for you to read more details at the Bible Places Blog here. I have had the opportunity for several days to see the various materials associated with the Satellite Bible Atlas, but late Monday I received my beautiful copy and have found it to be an amazing production. After 17 pages of beautiful satellite maps, the additional maps are printed on one page with a brief, numbered, commentary on the opposite page. For example, looking at map 5-1, Samuel’s Ministry, we see a marked map of the portion of the land where Samson was born, and the places of his activity. Map 9-4 shows Jesus’ Move from Nazareth to Capernaum. Map 10-1 shows Acts of the Apostles in Israel. While the emphasis is on the Promised Land and the history of Israel, Jesus and the Early Church, there are maps showing the Journeys of Paul, The First Revolt Against Rome (c. 66-73 AD), the Bar Kochva Revolt, Jerusalem, the modern Middle East, etc. Eighty-five maps in all. This beautiful book is published in Israel. I am surprised that the book is available for $30 plus tax and $3 shipping (in the U.S.). You will also be granted access to download the maps. More information and ordering instructions are available here. Sample Maps, Commentary, Study Questions, and an Index to Sites, are available for download. There are also some Teaching Videos, and more are expected from time to time. This entry was posted in Archaeology, Bible Lands, Bible Places, Bible Study, Book Review, Books, Culture, Israel, New Testament, Old Testament, Photography, Travel and tagged Satellite Bible Atlas. Bookmark the permalink. Thank you for the information and thank you to the author for his wonderful teaching tool representations. Thanks you, Bill, for your work to make this a practical project. I am looking forward to using the SBA on my upcoming trip to Israel. Thanks for the review and glad you find the atlas helpful!